Summary: Praised as “a tender exploration of friendship, families, and first love” (Liane Moriarty, New York Times bestselling author of The Husband’s Secret), this coming-of-age novel from bestselling author Frances Whiting is equal parts heartwarming, accessible, and thought provoking. I wasn't sure what to expect when I picked up WALKING ON TRAMPOLINES by Frances Whiting. The cover was sure pretty and I so love coming-of-age stories, so I had a feeling that I'd at least like it. What surprised me is just how readable this book was... and that's saying something because my attention span these past few months isn't what it used to be. WALKING ON TRAMPOLINES is most certainly a coming-of-age story for Tallulah de Longland, called Lulu for short. The book begins when Lulu wakes up with a serious hangover next to her ex-boyfriend and the love of her life... the day after his wedding to her childhood best friend Annabelle Andrews. I honestly didn't know what to make of Lulu! The novel takes the reader back to when the girls were twelve years old and met for the first time. Lulu was absolutely enamored by Annabelle and her life. The girls quickly became inseparable and shared everything... even Lulu's boyfriend! When Lulu discovered this betrayal the day of their high school graduation, she was devastated; and needless to say, things were never the same for the two girls. After Lulu sleeps with her ex (who is also now Annabelle's husband), her life takes a tragic turn for the worst. Not only does she have to deal with her guilt on a personal level, but the story hits the papers and television. WALKING ON TRAMPOLINES shows how Lulu, with the help of her family and friends, works through her life problems... including some very heavy baggage from her past. I really, really liked WALKING ON TRAMPOLINES. The book was a quick read for me because I got very caught up in Lulu's life. The cast of characters was interesting, as were the dynamics between them; and the writing was strong. However, I think what I enjoyed the most about this book was how it portrayed friendships, self-discovery, and forgiveness. I have to admit that Lulu was a very complex character, and I wasn't sure I liked her after what she did to Annabelle. That changed pretty quickly when I discovered the truth about her childhood and how damaged she was. In fact, I grew to really like Lulu a lot! Despite her little encounter with her ex, I knew she was a good person; however, I also recognized that she had a lot of growing up to do! And that's where one very special character came in! Lulu began working for a famous radio host named Duncan, and this character was larger than life. I loved Lulu and Duncan's relationship -- both learned and grew as a result of it; and I definitely think they were able to bring out things in each other that no one else could. Duncan's huge dog was also a fun character that helped Lulu heal. Duncan and his dog also provided some humorous scenes to the story! As Lulu began to accept herself and what happened to her in the past, she really blossomed into a fantastic character. Naturally she was hesitant to enter new relationships, mainly because she thought she was so damaged and couldn't forgive herself. I appreciated seeing how much she grew by the end of the novel, and I was glad to see her move forward with her life. WALKING ON TRAMPOLINES was a great read but it was also one of those stories that tugged at my heart. I don't want to give too much away, but this story does deal with some serious issues as well as some major pain in Lulu's life. I found myself tearing up at a few scenes in this novel and wondering how Lulu would be able to recover from them. I'm pretty sure you can tell by now that WALKING ON TRAMPOLINES would make a wonderful book club pick. There is a reading group guide available with thirteen questions along with a few ideas to enhance your book club. Some of the themes you might want to explore include female, friendship, love, family, mental illness, marriage, betrayal, heartbreak, first love, fear, self-discovery, and forgiveness. 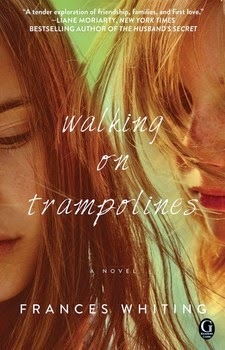 WALKING ON TRAMPOLINES is an interesting coming-of-age story that deals with love, loss, and forgiveness. I highly recommend it to fans of women's fiction. Wow, Lulu does sound like quite the fascinating character! This looks like a great balance of complexity and a fun read. This one is completely new to me. But I love coming-of-age stories. I'll look for this as summer read.